is a decorative and artistic image created by inlaying small pieces of colored glass, ceramic tile or other material to form a picture or a pattern. Mosaic art can be found in civilizations over 4,000 years old. The Greeks elevated mosaics from simple stone patterns more organized and stylized works of art. By 200 BC the Greeks developed special tiles called "tesserae") wheich were used to add color and detail to their art. 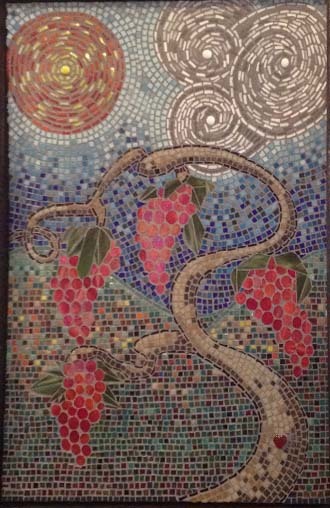 Depicted is a mosaic made from glass and ceramic tiles by a northern California artist tittled "Mother Grapvine".